Like CNN in the 1991 Gulf War, the Arabic al-Jazeera news network is becoming part of the story of the current war in Iraq. CNN outstripped its competitors 13 years ago with its rolling live coverage of the outbreak of hostilities and seemed always to be in the right place at the right time to report the war's main events live. Al-Jazeera is drawing a growing audience. It is also drawing some angry criticism, for filming and broadcasting pictures that other networks have not got or will not show. UK Prime Minister Tony Blair has expressed "horror" at the broadcast of pictures believed to show two dead British soldiers. The Commander of the UK forces in the Gulf, Air Marshall Brian Burridge condemned al-Jazeera's broadcasts as "deplorable" and a "flagrant breach" of the Geneva Convention. He also warned journalists not to become part of the "Iraqi propaganda machine". Al-Jazeera drew criticism from the US for broadcasting footage of killed and captured American soldiers. The channel's executives have responded by arguing that the coalition leaders are disapproving because it is becoming more difficult for the US and UK to manage the reporting of the war. For the first time, Arab news networks, including competitors like Abu Dhabi's TV station, have had a big audience and greater access to some areas of Iraq than western stations, Yosri Fouda, the bureau chief for al-Jazeera in London told BBC News Online. "I can see why American and British politicians and military leaders don't like us showing these pictures. They show a side of the war that they don't want projected because it may affect public opinion in their country negatively. "In these things, the western media is highly sanitised. You are not seeing what war, this war, is actually like. "As for the Geneva Convention, there are double standards here. We and other broadcasters were not criticised for showing pictures of Iraqi dead and captured, or those famous pictures from Guantanamo Bay," Yosri Fouda said. 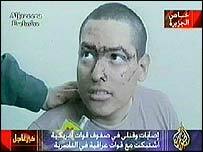 By Western television standards, the pictures shown by al-Jazeera and other Arabic news stations are shockingly graphic. The channels will readily show for far longer and in greater detail scenes of carnage in Baghdad, Gaza or Jerusalem. "For western audiences," al-Jazeera's Yosri Fouda said, "Part of the shock is in seeing American and British dead bodies and POWs." The channel also has correspondents all over Iraq. While it has reporters with coalition troops and at Central Command in Qatar, it also has reporters in towns that the western media cannot reach. When western journalists outside Basra were speculating about an uprising on the basis of coalition briefings, al-Jazeera's correspondent inside the city was reporting first hand that "the streets are very calm and there are no indications of violence or riots". In the current conflict al-Jazeera is referring to US and UK forces in Iraq as "invading forces", not "forces of aggression" - the standard phrase on Arabic TV stations, including Iraq's. 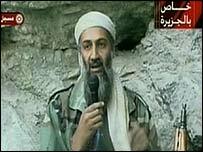 Al-Jazeera's reputation in the West was made during and after the war in Afghanistan, when it broadcast exclusive messages from Osama Bin Laden. In the Arabic-speaking world, al-Jazeera has for years had a large and loyal audience and a reputation as innovative and hard-hitting. Most importantly it is seen as independent of the smothering restrictions widely suffered by national broadcasters in the Middle East. Al-Jazeera was launched after the closure of the BBC World Service's Arabic language TV newsroom in 1996. Many of al-Jazeera's editors, journalists, presenters and technical staff cut their teeth as TV journalists with the BBC in London. The channel revolutionised Arabic language news by taking a critical and combative style to officials and religious leaders and tackling issues too sensitive for other Arabic language broadcasters to touch. US officials have criticised the channel as anti-American and encouraging Islamic militancy. According to al-Jazeera, the number of subscribers to the channel in Europe has doubled since the start of the war in Iraq. The channel explains this audience increase, and its appeal in general, as a huge demand for an alternative to western reporting of the war. Arab TV viewers go to al-Jazeera because they see it as an independent news channel that sees the world as they do. Western broadcasters are seen by many Arabs and Muslims as pro-western and uncritical of Israel. While allowing interviewees to criticise the United States in terms that would seldom be seen on western TV screens, the channel has also carried long interviews with Tony Blair, Condoleezza Rice, Donald Rumsfeld and Ariel Sharon. The channel has also got on the wrong side of several Arab regimes. Its reporters have at times been banned or harassed in Egypt, Kuwait, Jordan and the Palestinian Authority. It has been criticised by Saudi Arabia and was according to al-Jazeera described by Bahrain as being pro-Zionist. In a timely coup, al-Jazeera this week won a "Freedom of Expression" award for its general news coverage from Index on Censorship, an international group which campaigns against censorship. Amid the criticism they have been facing, defenders of the channel may see this as confirmation that al-Jazeera is doing a job the western media is not and that the criticisms are an attempt to muzzle it. Most Popular Now | 29,800 pages were read in the last minute.